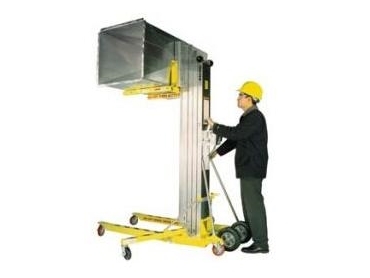 Kerrick Industrial Equipment offers Series 2100 material lifts, versatile units that are manufactured from galvanised steel and are suitable for all round contractor lift applications. Incorporating a tall mast to reach desired work heights while requiring fewer mast sections, these material lifts are cost effective and light. They require no tools or loose hardware to operate, with a leg lock mechanism that releases with the push of a button and locks in the stored position. Leg rollers allow these lifts to be wheeled around, and forks are removed by pulling plunger pins. By pulling the plunger pins, forks can be repositioned for added height, or to ensure flush alignment with a ceiling.